Searching for a look that is time-tested and adds beautiful elegance to your home? Well, your search is over at A to Z Flooring America [link to https://www.flooringamerica-enid.com/] with our hardwood flooring in Enid, OK. For decades, hardwood has been the premier choice for homeowners, and with current technologies, the option is better than ever.We are proud to offer one of the largest selections of hardwood around, with countless species and designs to choose from. Regardless of the look, you are trying to achieve; we have the flooring options that meet your needs. 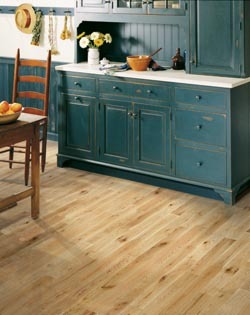 When selecting hardwood floors, there are two major varieties to choose from -- engineered and solid. Engineered hardwood flooring is made from pressing multiple thin layers of wood together around a central core. This construction makes the planks flexible and allows them to expand or contract when they come into contact with moisture. This helps to keep the boards fitted in place on the floor and prevents your surface from warping when it gets wet. The other type of wood flooring is solid. With solid hardwood, each plank is made from a single piece of wood. This gives the floor higher durability than engineered, but it no longer stands up as well to moisture. Additionally, solid hardwood can be sanded and refinished, extending the life of your floors. After you purchase our expertly crafted solid or engineered wood flooring, you need to have it professionally installed. At our store, we are proud to offer complete installation services for your new floor surfaces. Our team of installers has the experience and tools to handle any flooring project, whether you are replacing a single room or your whole home. By letting our team take care of your install, we guarantee that it will look as good as it did in our showroom. Additionally, our installers will give you advice on how to keep your floors looking great and what steps to take for their maintenance. This way, your hardwood flooring continues to look great long after installation is complete. Contact us today to explore the many hardwood options we have available. We proudly serve Enid, OK, and the surrounding areas.